There sure has been a flurry of releases in the Indie gaming world. Our busy reviewers are getting swamped under all of the review codes. 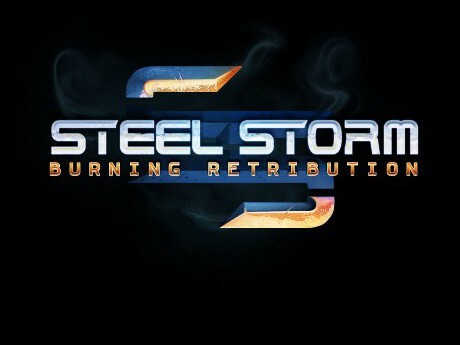 Today, we’re going to look at Steel Storm: Burning Retribution. 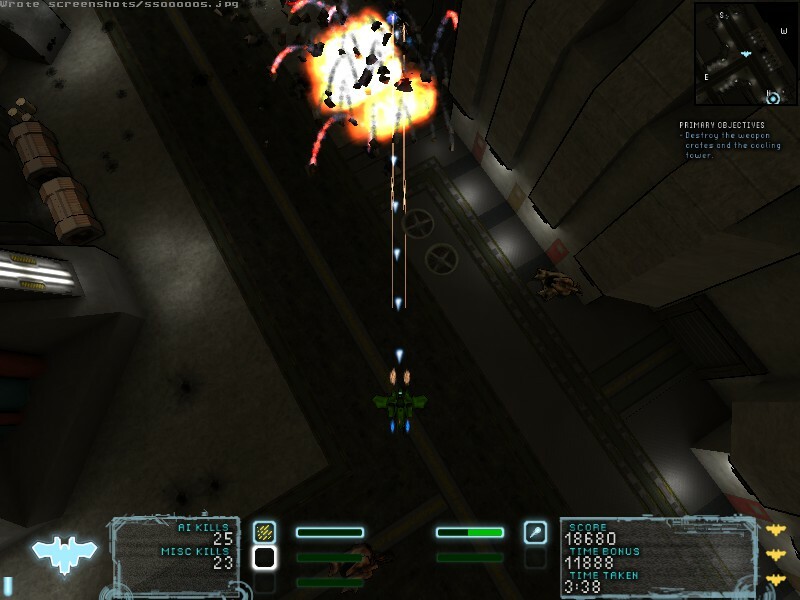 It is a Top Down Shooter from Kot-in-Action, and as you will learn from the review below, Top Down Shooter does not equal necessarily equal Shmup. I don't care how many explosions I cause, it is always satisfying. The graphics of this game aren’t drop dead gorgeous, but they certainly get the job done. 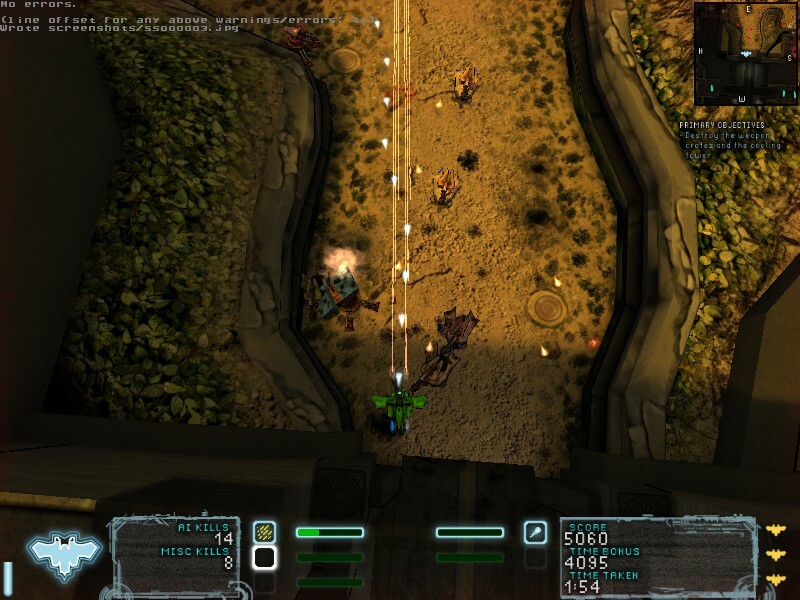 It is played, as previously stated, with a top down camera view, and to the developer’s credit, this view is extremely tweakable. There are four presets: Top-Down, Cinematic, Perspective, and Old-School. Each one is simply a configuration of certain camera values that you can manually customize, including how much the view lags behind movement, the camera’s angle, etc. There is even a conspicuously grayed out 1st person mode box that intrigued me. You can also adjust the color of your tank on a per profile basis. That's an impressive amount of camera control. In game, the art style is slightly cell shaded. Colors are vibrant, and there are sharp black lines defining edges. 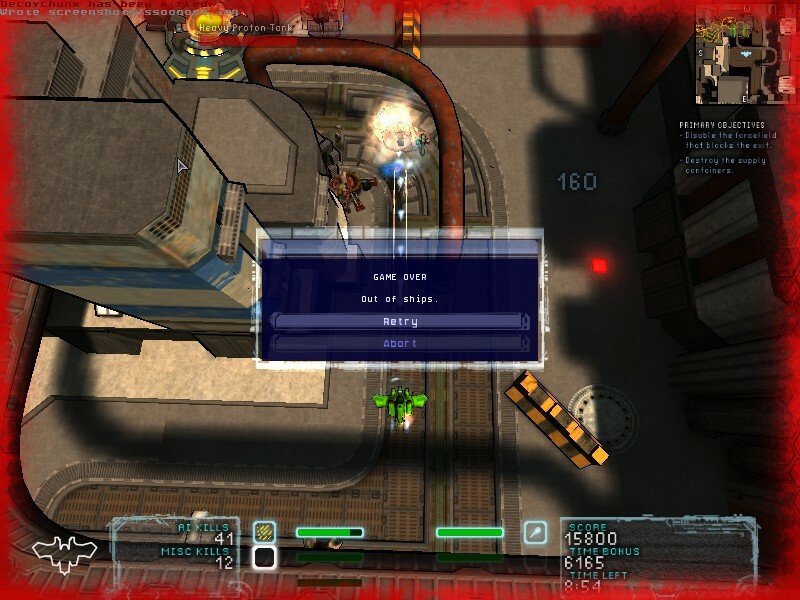 Explosions are suitably fiery and spew wreckage, and enemy tanks and destructible pieces of environment begin to burn when they take enough damage. Likewise, the different weapons have very distinctive appearances, with your ships default machine gun showing up as scattered yellow lines. This, coupled with a semi-transparent pointer overlay helps you aim, but the visual feedback can be problematic at times. More than once I caused an enemy to burst into flames and, thinking I had destroyed it, moved on to the next one, only to learn that it was still limping along well enough to get in a few cheap shots before I finished it off. Likewise, the near constant fire coming from my own tank as I desperately tried to blast things to pieces tended to mask their return fire if I wasn’t paying attention. Even after playing through the first episode, I still found myself falling for it. Whether you find this a graphical quirk or a clever deepening of gameplay and strategy really boils down to personal preference. Sometimes chunks of the environment obscure view. The game does a good job making pickups and level objectives fairly obvious, and a minimap in the corner helps you scope out enemies and figure out where a transporter will likely be sending you. There is a strong arcade feel to the on screen indicators, as well, with point values popping up and fading away, and a double/triple kill indicator showing up when you are on a roll. Overall, the visuals of the game were quite well done. When I hear “Top Down Shooter” two different game types come to mind. One is the standard autoscrolling shmup, the other is a SmashTV style game. This, while certainly a Top Down Shooter, is neither of those. You control a hover tank that can strafe and rotate, and you must navigate levels until you have completed a set of objectives. These objectives range from simply getting from point A to point B (usually hunting down and activating switches to open doors along the way) to wiping out the enemy or destroying specific landmarks. 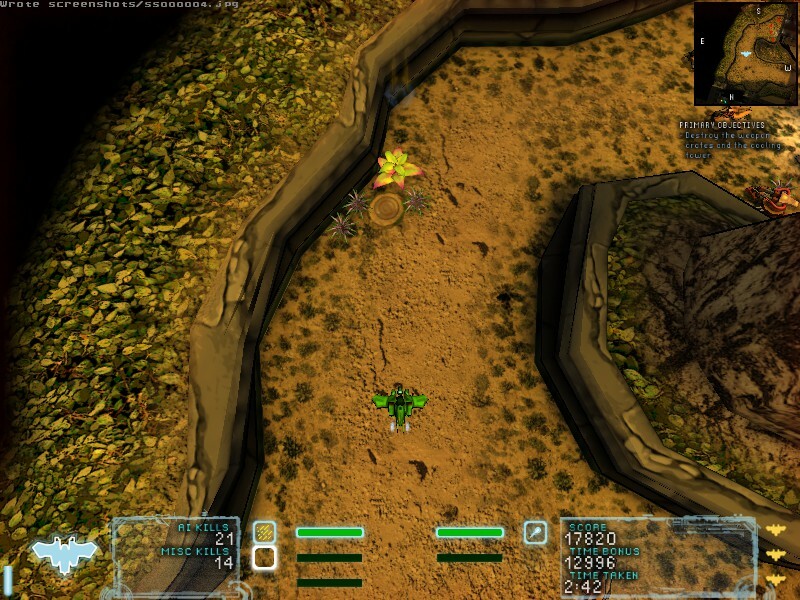 The levels tend to be maze-like complexes, but open fields are thrown in for good measure. Some levels add additional levels of difficulty, too, like giving you a time limit. Considering how much more powerful than you the mini-boss tanks are, particularly early on, it is nice that you don’t have to do it all in one life. 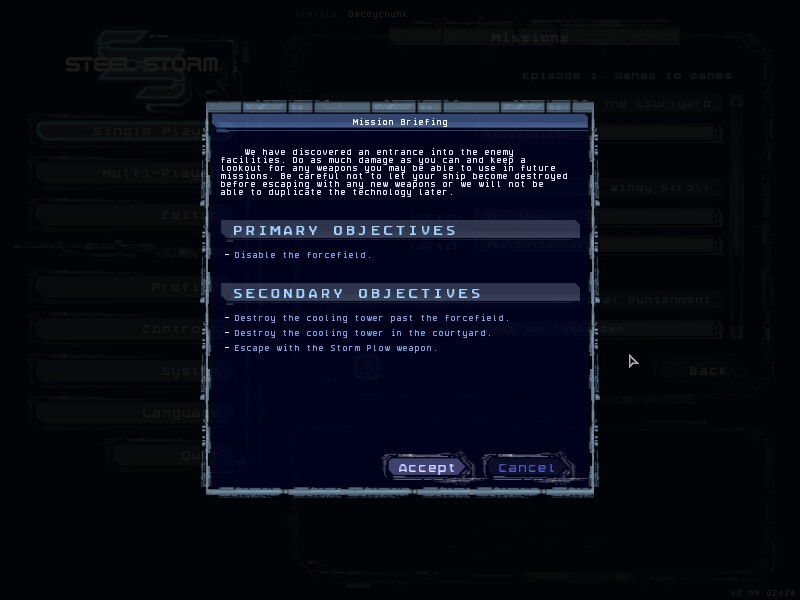 On default settings you get three tries, with a death spawning you back at the starting point, and stripping you of any secondary weapons you picked up on that level, but that’s where one of the more unique aspects of the game comes in. Respawn is a VERY welcome option. Whenever you pick up a weapon upgrade, it automatically applies. 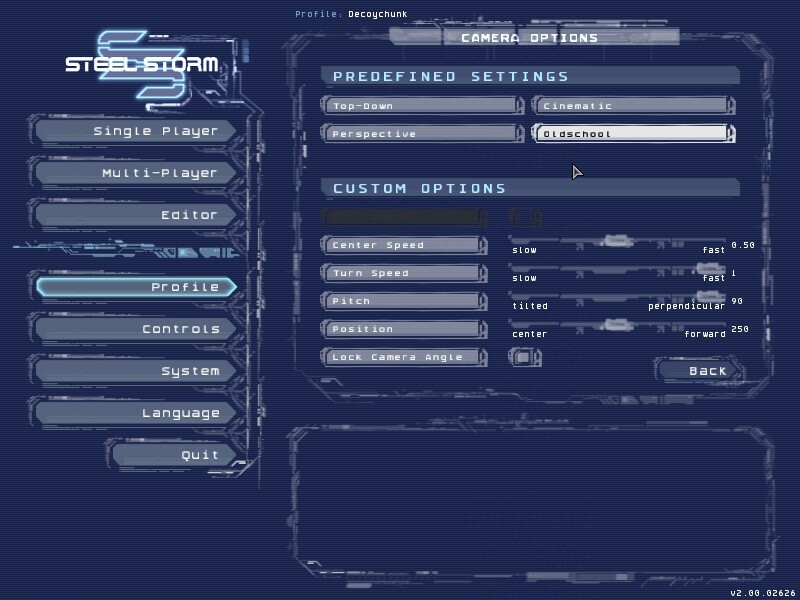 You have a machine gun by default, and it is quickly joined by a plasma type weapon which fires simultaneously. 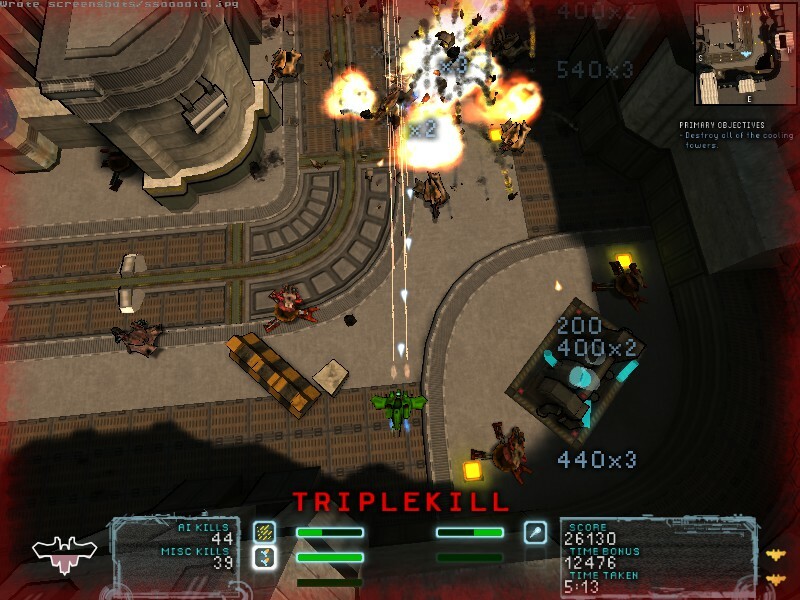 Secondary weapons include sniper-lasers, swarm bombs, cluster missiles… the list goes on. If you die, every weapon you’ve picked up on the current level is lost. That much is fairly standard. If you finish the level without losing them, however, those upgrades become a permanent part of your arsenal. Once I realized this, it entirely altered my play style. Previously I had been sprinting to the powerup to get a few heavy hits in on the enemies before they took me out. After I realized that if I could hold onto that fancy rocket launcher it would be mine to keep, I duked it out with them with what I had, until the exit was clear, then snatched the power ups and used them to mop up the inevitable turkey shoot that spawns on pickup. That was one aspect of the game that both kept it challenging and got on my nerves. Certain events trigger enemy spawns, and more often than not, it is a full ambush. Imagine, if you will, picking off a half dozen enemy tanks and turrets, whittling down their forces until there is a single turret and a health item. Then, when you take out that turret, six more tanks spawn in a circle around you. This is fine if you’ve been doing a good job of dodging, which despite the realistic momentum of your ship is extremely possible, but if you’ve been getting pounded, the second ambush is a slap in the face. Want something to eat? EAT LASER!!! AHAHAHAHAHA! The level design frequently has you retracing your footsteps. This means that the shield and health power ups scattered liberally throughout the level should be rationed, because you never know what kind of shape you’ll be in when you revisit this area later. This is especially true when you’ve had to face off against the heavy tanks that serve as bosses. 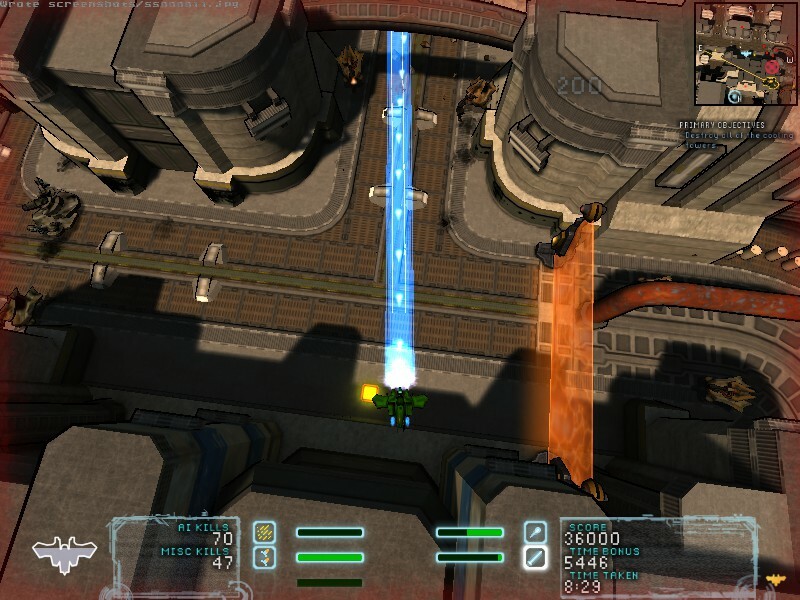 They have a great big health bar, and if you are foolish enough to get hit by a concentrated burst of their miniguns or proton beams, they will rip through your ship in moments, full health or no. 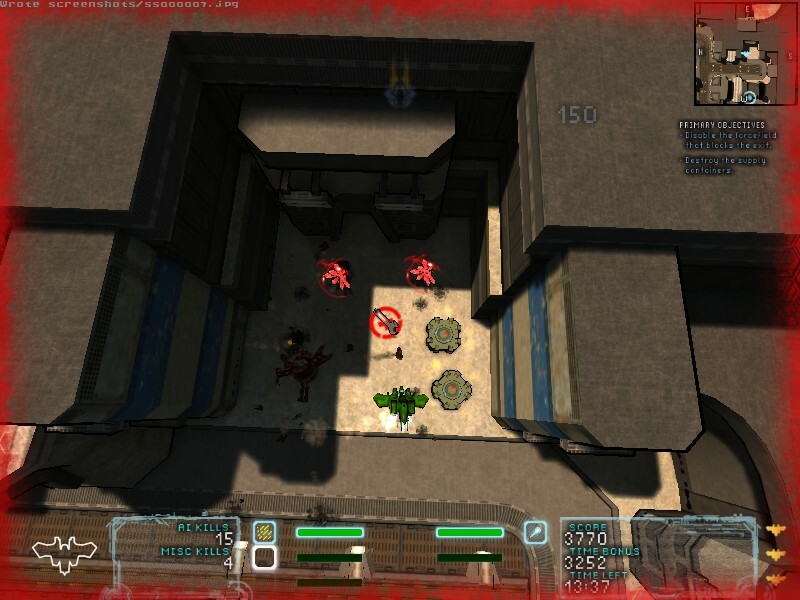 There are relatively few enemy types, with the first level featuring enemy versions of your own tank (of various levels of armor and fire power) as well as the minigun and proton flavors of boss tanks, and turrets. The final “enemy” is what appears to be a repair laser, and was the bane of my existence, perpetually repairing the same turret until I noticed that there were TWO red dots on my map. Early in the second episode you start to see more variety. I’ve mostly spoken of Single Player campaign, but this game naturally has server based multiplayer of all of the usual flavors, including the obligatory deathmatch. The servers were plentiful, too, and there is a level editor build into the game that will let you flex your creative muscles. Also, I found the AI to be surprisingly good. Rather than just blitzing me, enemy tanks would sweep in, attack, and retreat, dipping behind cover and pulling out of range. The super-sized boss tanks, on the other hand, seemed to be prone to lodging themselves in a corner for a while. I suspect this was an instance of attempting to pull the same “sweep in and out of cover” tactics with a MUCH slower and less maneuverable vessel. As a final point, the controls of this game take a little getting used to. It uses the standard wasd setup for strafing, and that much was easy. The mouse pivots your tank, which is pretty obvious, too. The tricky bit for me was that the pivoting wasn’t as a result of following a mouse pointer, but instead by offseting with the motion of the x axis. 99% of the time, with the right mouse speed settings the two methods function identically, but early on I was confused as to why my tank didn’t feel like turning around. I also didn’t have the patience to figure out how to get this working properly with a controller, either. I don’t know why, but I really enjoyed certain aspects of this game’s audio. The music fit, sure, but the sound effects were what I liked best. 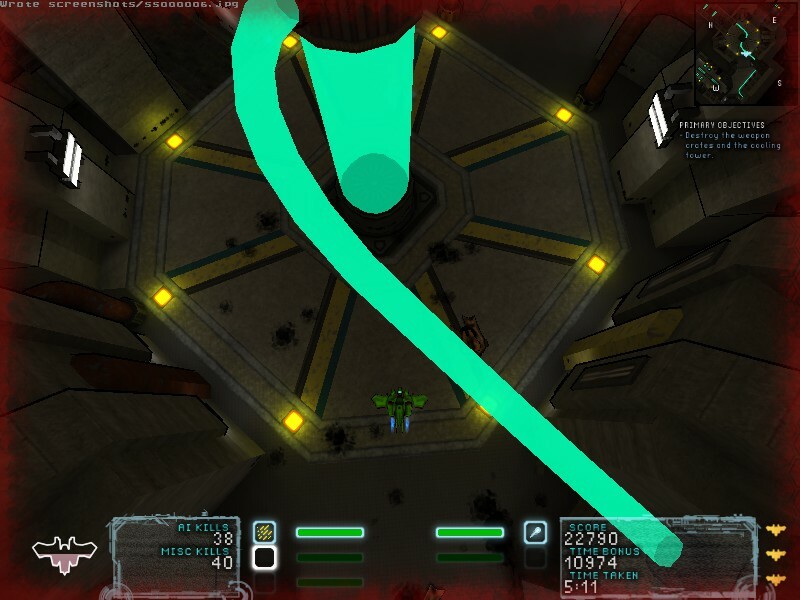 There is audio feedback that lets you know if you are hitting an enemy, a subtle tinkle of bullets hitting their hull, that helps you target even when they are off your screen. When you pick up a score crystal, it makes a sound that reminds me of dropping a quarter into an arcade. For some reason, that sound alone had me wanting to find more score items. There. Words. Words equal story. There is a story. It is about invasion and infiltration. You learn about it in mission briefing style snippets. It is fairly minimal, essentially just there so that you can put a check mark in the “story” box on your checklist. Steel Storm won’t blow you away, but it is solidly constructed and fun to play, and the multiplayer mode means that, with the right set of friends, it could definitely be a blast with infinite replay value. 7.8 / 10: A simple, well made shooter with some unique tricks up its sleeve. That’s an impressive amount of camera control. I don’t care how many explosions I cause, it is always satisfying.